We already knew the Dubai Police were incapable of half-measures, so I guess it’s no surprise their new utility vehicle has a fairly massive lift, desert prerunner bumper, and fender flares like Terry Crews’ deltoids. 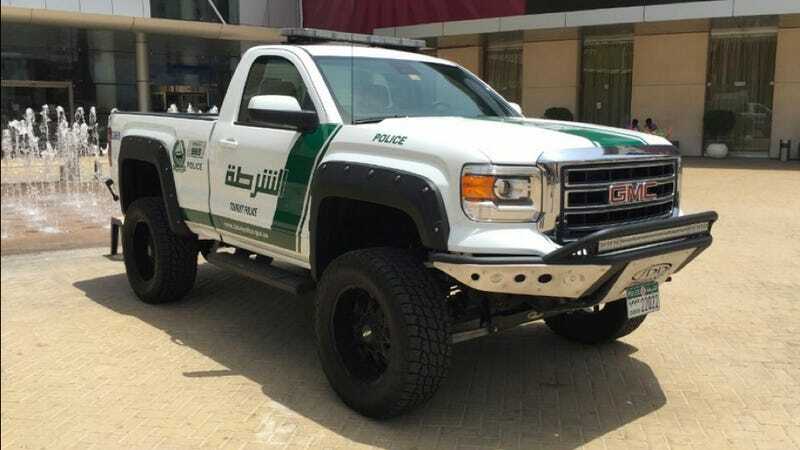 What do you think of Dubai PD’s 2015 GMC Sierra off-roader? Haven’t heard back from the boys in blue (er, white and green) yet regarding what they’ve done to this thing exactly. But if you’re wondering what sets their Sierra apart from poser pickups, it’s the tires that have more than an inch of sidewall. Looks like Dubai PD’s Chief Information Officer Khalid Alrazooqi took it for a spin about a month ago, but apparently the truck’s making its first public appearance today at the 2015 Arabian Travel Market expo. As a fan of GMCs, regular cab pickups, and desert trucks, and police vehicles... I think this rig is pretty righteous. Hope we get to see the Dubai PD Sierra sending-it over sand dunes in the next Dubai Police video.